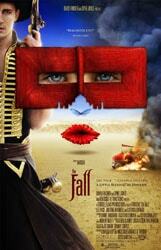 Tarsem Singh’s 2006 adventure fantasy The Fall transports us to 1920s California, to a hospital where two convalescing characters form an unlikely bond through the magic of telling stories. The best stories are the ones that take us outside ourselves, but when we return to reality, something has changed. Tarsem Singh’s 2006 adventure fantasy The Fall transports us to 1920s California, to a sanatorium where ice is still delivered by truck and the X-ray technicians wear suits of armor. Here, two convalescing characters form an unlikely bond: Alexandria, a little girl who broke her arm working in the oranges groves, and Roy, a heartbroken stuntman played by the ever-charming Lee Pace. Roy begins to tell Alexandria an epic tale of five extraordinary heroes who have all been wronged by the villain Odious and now seek revenge. Along with Alexandria, we imagine a majestic world where heroes swim with elephants and trees instantaneously catch fire. But it soon becomes clear that Roy’s own broken life is seeping into the world of the story, and what he seeks is not a happy ending, but the vial of morphine in the medicine closet. Bringing us back to the early days of film, The Fall reminds us not only why we tell stories, but also why we listen to them. Saturated with visually stunning scenes, it rivals even our own imaginations, with a little bit of something for everyone.